Committee meetings play an important role in the running of both nonprofit and for-profit businesses. 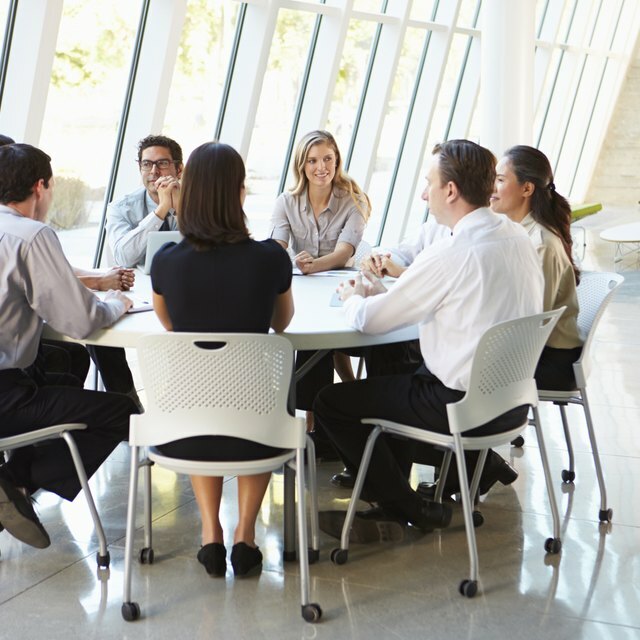 While some committees operate on an informal basis, with members meeting as needed to accomplish specific tasks, other committees are more formal. Some have legal responsibilities for such things as financial audits, executive selection, stock offerings, membership approvals and safety oversight. These committees are more likely to adopt a formal meeting structure using such protocols as Robert's Rules of Order or similar rules. Prepare and send a written agenda at least a week before the committee meeting. Everyone on the committee needs time to review the agenda and prepare for the topics that will be discussed during the meeting. Call the meeting to order on time. This is typically done by the committee chair. The secretary will take note of everyone who is present at the meeting while taking minutes. Calling the meeting to order on time encourages people to show up on time and demonstrates respect for all of the committee members and their time. Distribute copies of the agenda and any reports that will be presented during the meeting. If the committee meets on an ongoing basis, distribute copies of the previous meeting's minutes. Allow time for committee members to review the minutes, agenda and other reports. Ask whether there are any comments about the minutes of the previous meeting and then ask if there is a motion and a second to accept the minutes. Follow the order of the agenda to cover each item during the meeting. Allow motions to be made that are relevant to the agenda item under discussion. Recognize each member who wishes to speak on a motion. Allow one person to speak at a time and give each person a chance to be heard, if feasible. Call for a vote on the motion when discussion has been completed. In some cases, members will propose amendments and the committee chair will call for a vote on the amendments before the motion. End the meeting when the agenda has been completed or when the scheduled end of the meeting time arrives. The committee chair may adjourn a meeting without a motion, second or vote. The secretary records any incomplete business so that it can be put on the next meeting's agenda. Most formal committee meetings require a quorum of members to be present for the meeting to be valid. The organization's bylaws will define how a quorum is achieved. It is usually at least half of the members.